Life on the go doesn't always allow for kicking back, relaxing, and listening to our favorite tunes. And it's hard to keep the hits rolling at the office without disturbing anyone around you. So go ahead and connect your Gear Sport to some sweet Bluetooth headphones and enjoy the soundtrack of your life! Let's hook you up so you can start playing your favorite jams. 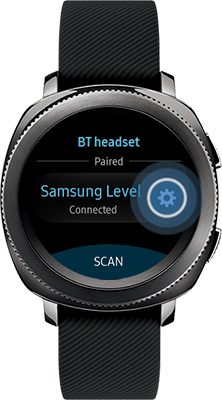 Read on to learn how to pair your Gear Sport with a Bluetooth headset. 1 From your watch, navigate to Settings. 4 Touch BT headset. Make sure your Bluetooth headset is in pairing mode. 5 Once a Bluetooth headset is displayed, touch its name on your watch's screen. 6 Now your headset is connected via Bluetooth and ready to use. To disconnect, touch the Settings icon next to the headset's name. 7 Touch the Check icon to end the connection.